It is Ruth here with you for this post, and as you know now, at PAHQ they are busy as beavers getting ready for the trade shows they are off to in a couple of weeks. In the meantime, I am here to share with you a sneak peek of Seth's latest creations. He has 2 stamps and 8 minis coming your way in January, and I'm pretty sure you're going to love these new additions as much as I do! As you can see, we are not giving much away yet, but all will be revealed soon, so make sure you are following PaperArtsy on all their socials as listed below. Retailers, please make sure you order the PaperArtsy January products now from the wholesale website before the team at PA HQ disappear to Arizona mid January! 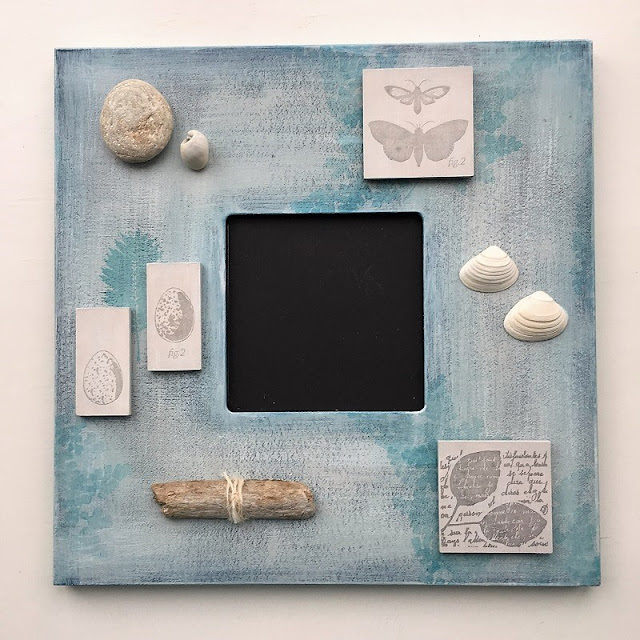 In the first 6 weeks of 2019, PaperArtsy are exhibiting their newest products at 3 tradeshows (restricted access events for retailers, manufacturers, and suppliers). There will be plenty of activity online from our product designers, many of whom are teaching or demoing at these events. Make sure to follow us all and stay in touch when we do live broadcasts! We still have spaces in most classes. You will take away a Product Pack from us and affiliate sponsors that exceeds the value of the class fee. 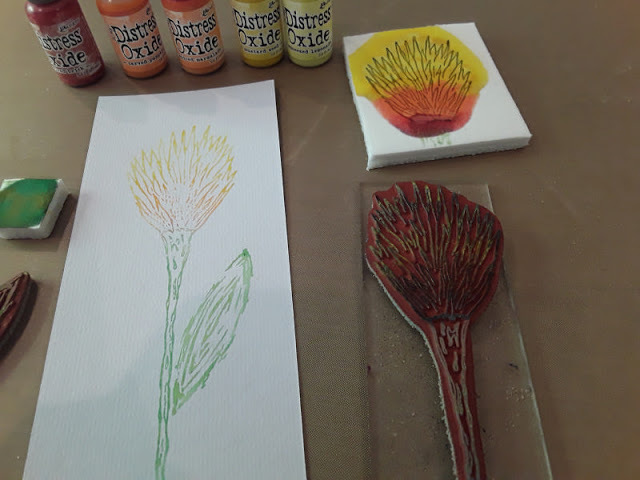 At the PaperArtsy Booth (950) we also have daily demos and make and takes. You can book MNT's at the booth, running every 45 minutes. We have 12 classes, of various length, planned across all designer lines with a maximum capacity of 16 per class. You will take away a product pack with you well in excess of the class fee. All classes are held on stand K18, on the main show floor. 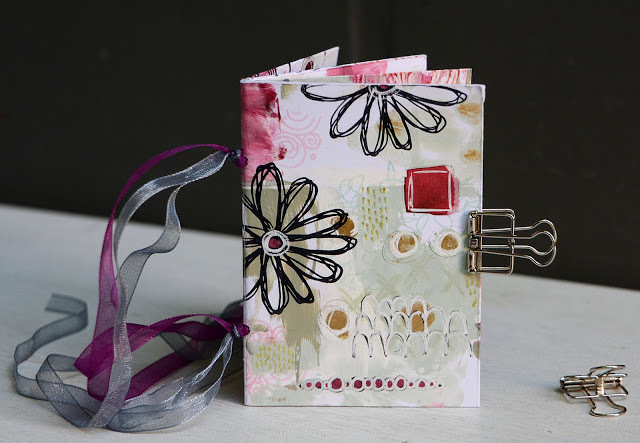 Book classes now via PaperArtsy Wholesale website. 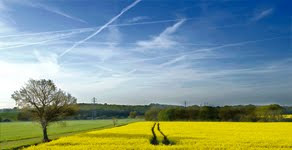 It is Miriam here with you for this post, and guess what!? 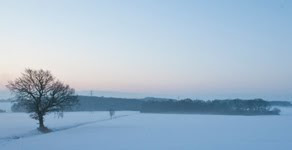 ....At PAHQ they are working very hard to get ready for all the new product announcements coming to you in January. They have 3 trade shows in 3 countries starting mid January, so there are lots of new goodies coming your way! 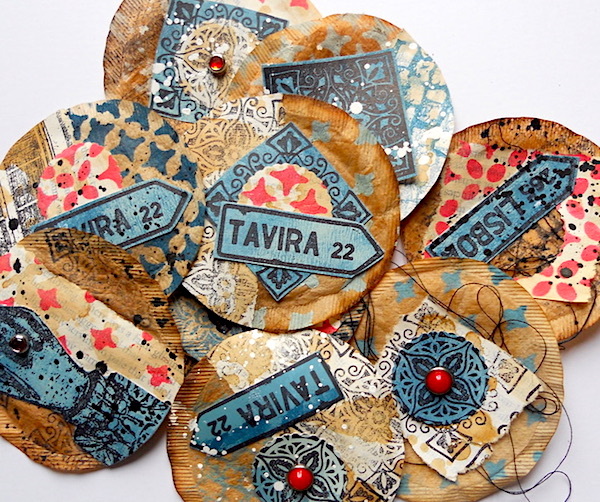 I'm here to share a sneak peek from one of my favourite PaperArtsy product designers, Sara! I've been having fun testing out the shaving foam technique...But I'll share that with you mid-January, for now, just a teensy look at Sara's latest creations. As you can see, we are not giving much away yet, but all will be revealed soon so make sure you are following PaperArtsy on all their socials as listed below. You can see more from me with these stamps on Jan 14th, 2019. 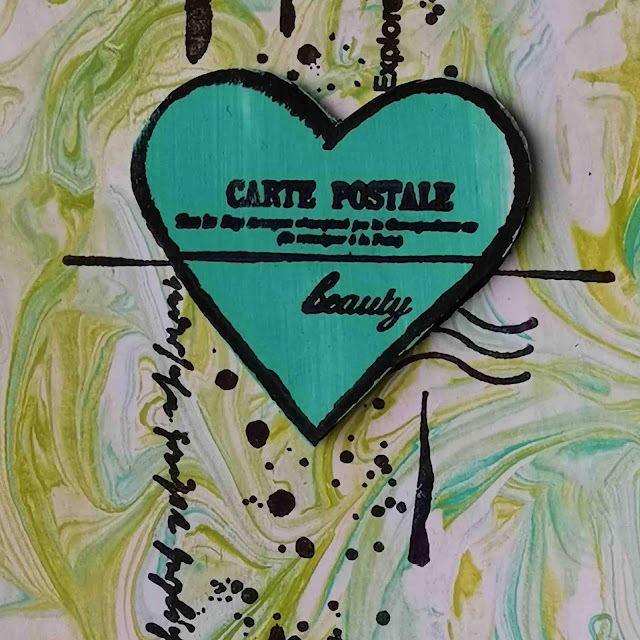 Retailers, please make sure you order the PaperArtsy January products now from the wholesale website before the team at PA HQ disappear to Arizona in a couple of weeks! Have you managed to clear all those Xmas food leftovers yet? Well keep at it! here is our final post for the year in review, and then we take a break until the new year when we start sharing our new product releases, well some sneak peeks to begin with! Lets see what Alison loved about the final topics of 2018. Hello all, Alison here again from Words and Pictures. As I said in my earlier round-up on Christmas Day, I missed so much this year, so this has been a great way for me to catch up with just some of the amazing work here on the PaperArtsy blog. Tonight I'm sharing my picks from Topics 17 - 21: Box of Eggs, Stamping Platforms, Tissue Paper, Foiling and Matchbox Art. The Box of Eggs colour challenge was inspired by the release of Courtney Franich, a.k.a. Miss PaperArtsy's new paint colours in July, which included some glorious neutrals and pale pastels, as well as some darker shades to complement them. They brought to mind the colours you might find in a box of eggs, as long as you include some species other than merely chickens! My first pick is this amazing layered collage by Kate Yetter. She went for the brighter and grungier end of the colour palette - though the duck-egg blue of the Seaglass paint is singing to me from the teacup! - and added in grunge paste for extra texture. The fussy-cutting of the Scrapcosy images is so worth it for the finished dimensional effect. 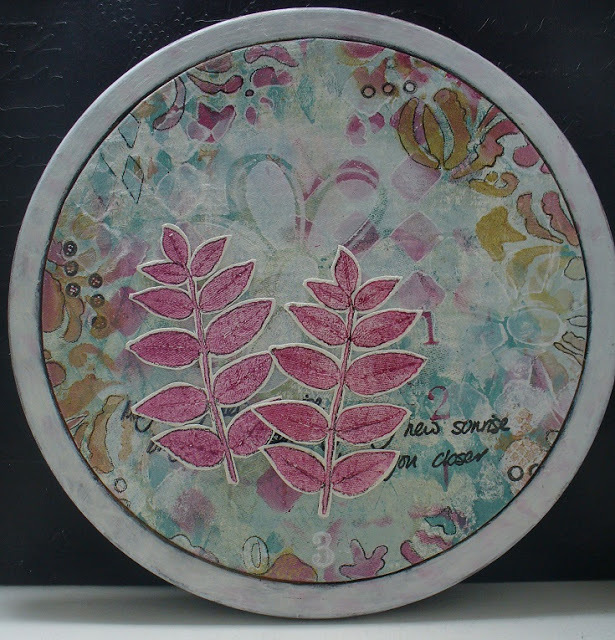 Ruth Mescall went to the other end of the colour scale with this pastel, neutral altered mirror frame. The delicate colours and textures are so ethereally pretty, and I love how she has balanced the composition - echoing the natural elements with the Urban Snapshots Nature Series images on the Stampbord panels. 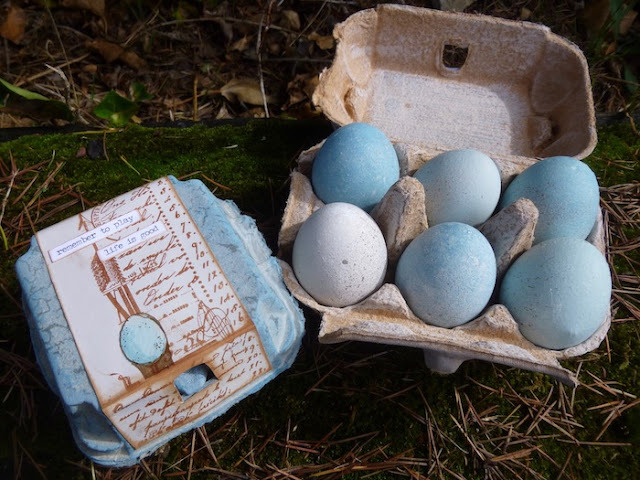 Okay, a slight blush as I offer up one of my own creations in this review... but I so enjoyed creating my actual box of eggs using Courtney's Box of Eggs-coloured paints. Ugly plastic eggs became decorative shelled objects, and I had a lovely time altering some of the newer Hot Picks images to suit my altered eggbox covers. A crazy idea, but it made me happy. We had some lovely entries to the challenge (which you can check out here, along with what must surely be one of the prettiest Intro posts of the year! ), and one which really caught my eye was this amazing woven panel created by Sue of Sue the Iron, using stamps by Lynne Perrella and Ellen Vargo. Fabulous! I love the Techniques challenges because you always learn so much. 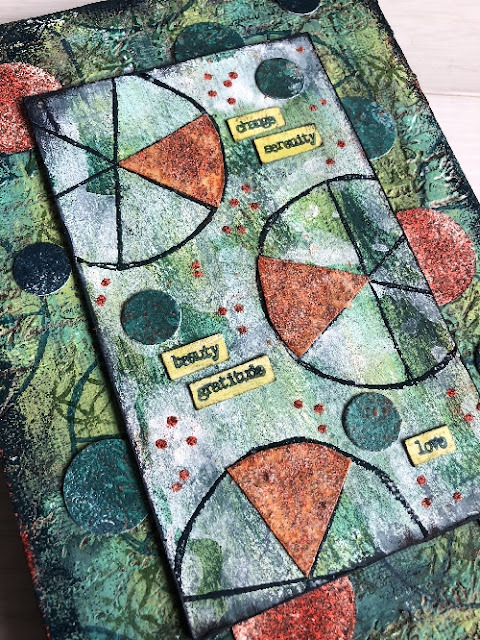 I've used my stamping platform occasionally, mainly just to get clear images on tricky surfaces, but the inspiration offered up in this fortnight has me raring to go and experiment more with what is clearly a very versatile tool in the craft room. Jo Firth-Young gave us a masterclass in inventive stamping techniques to create this delightful summertime floral wreath with her own JOFY stamps. She included really detailed notes and photos in the post of how to achieve this amazing look... so there are no excuses! Chris Dark combined her stamping platform with some gel shapes and Infusions powders to create her (early!) Christmas cards. 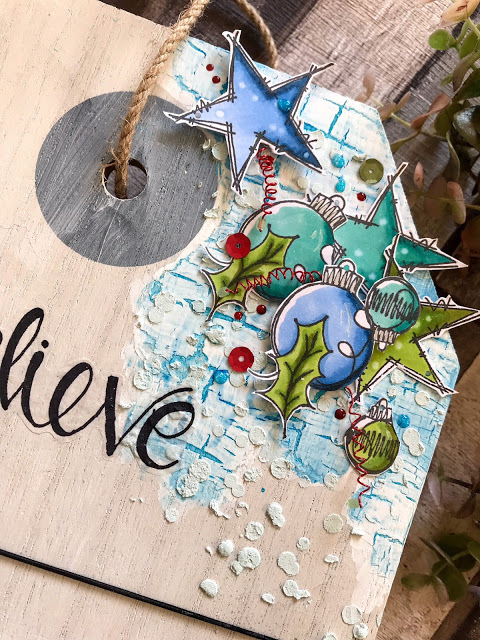 The grungy effects of the Infusions/gel shape stamping work so brilliantly with Darcy's quirky Eclectica festive stamps for a really original look. It was tough choosing which of her designs to share here, so do check out the post to see the others. There were plenty of great tips from Keren Baker on how to get a really high-quality finish when stamping on fabric. She also shared techniques using aperture stamping and slashing the fabric and ended up with this gorgeous textured bag, featuring stamps from several collections - Ink & the Dog, Hot Picks and Eclectica Seth Apter. There were some creative stamping platform techniques on show among the challenge entries too, and I've chosen this dramatic Black Widow coaster made by Flo of Florence and Freddie to highlight. She cleverly masked off the parts of the Lynne Perrella stamp which she didn't need, and created this spooky little treat. There was another brilliant Intro post for this topic... so many gorgeous ideas for transforming projects through the use of tissue paper. 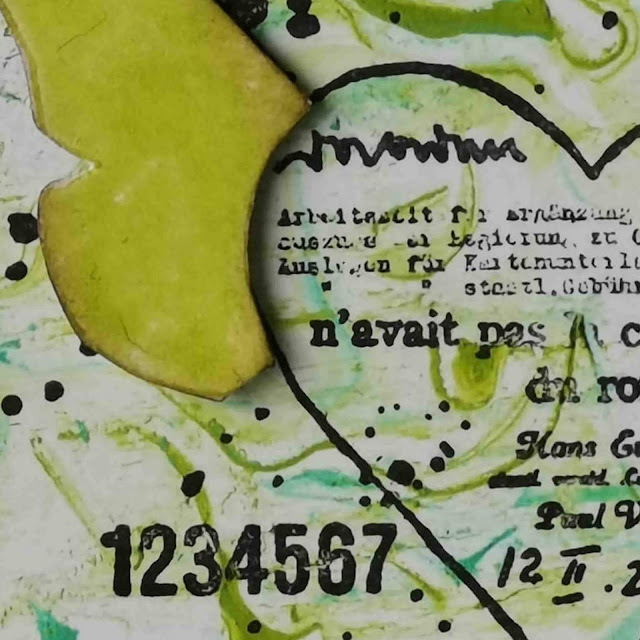 As always, the PaperArtsy Designers pulled out all the stops to show off what you can do with this humble ingredient. I loved the use of vintage tissue paper in the form of old sewing patterns in Jennie Atkinson's charming little gift box. 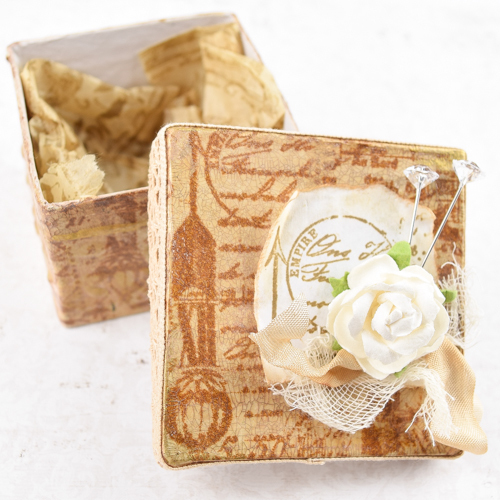 Her shabby chic style and neutral colour palette work perfectly with the Hot Picks stamps to create this elegant altered box, and there's even tissue paper on the inside to keep your treasures safe! 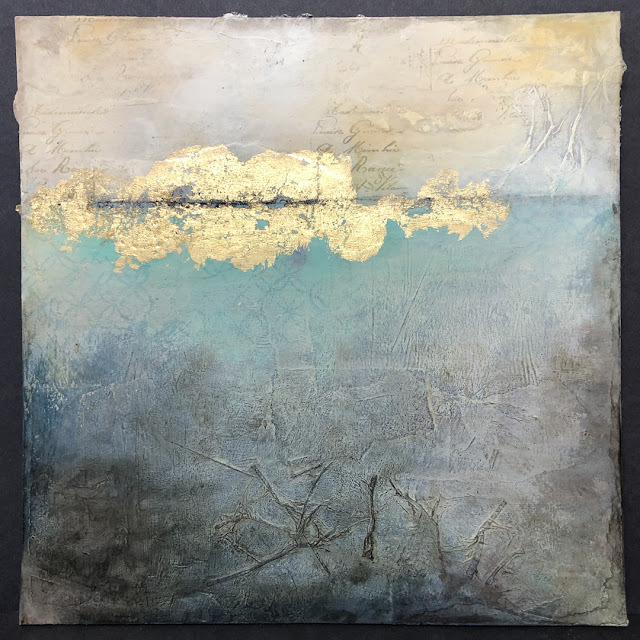 Ellie Knol used tissue paper to create texture as well as paper napkins to provide her main images for her altered cigar box. There's real delight in seeing how the tissue paper image can get into all the nooks and crannies of the intricate moulded embellishments she made to go on the top of the box. 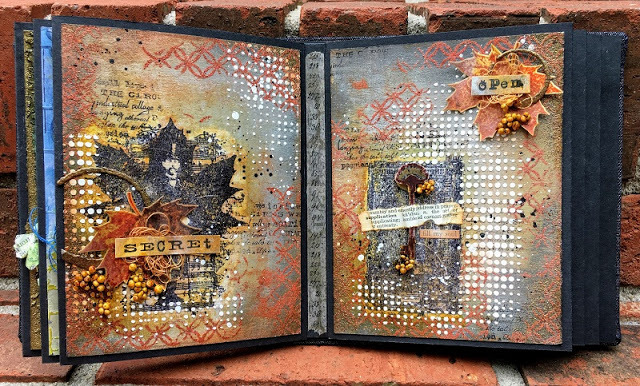 This exquisite autumnal page spread by Autumn Clark exploits the layering possibilities of tissue paper stamping. 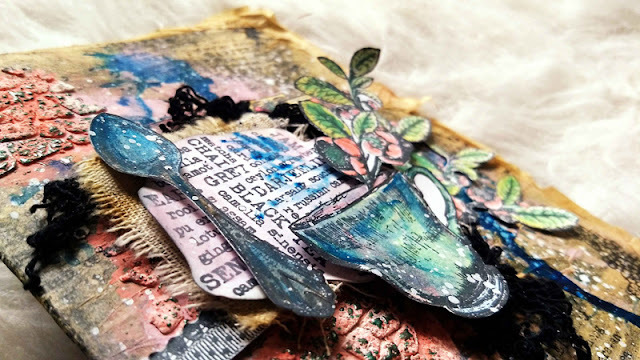 She shared lots of tips for reverse-painting your images on the tissue paper, and the layering of many Eclectica collections - Scrapcosy, Emma Godfrey, Lin Brown and my own Alison Bomber quote stamps - just adds to the depth and atmosphere she's created. There was lots of tissuey loveliness in the challenge entries too, but I particularly enjoyed the bright colours and bold shapes in these art journal pages by Rachel of Arty Beginnings. She combined paper napkin leaves with Ellen Vargo and Kay Carley stamps to make this cheerful spread. I tend towards the distressed rather than the shimmering end of crafting styles, but I do love the gleam of a metallic hit of foiling when I see it in action, and have been known to indulge in it myself at times. This theme was timed for the beginning of November - a perfect invitation to get going with some festive makes. Wanda Hentges picked up the festive challenge and really knocked it out of the park with her colourful collection of cards. 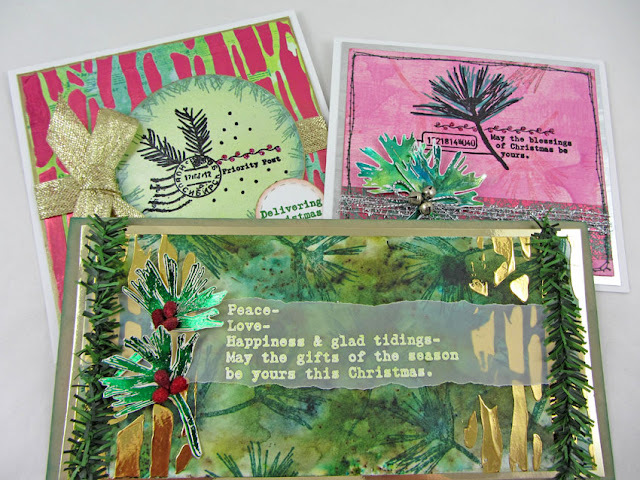 I love the glint of the foiling - especially those fabulous fussy-cut fir fronds - as well as the really inventive way the greetings are done differently on each card. That vellum overlay is wonderful. 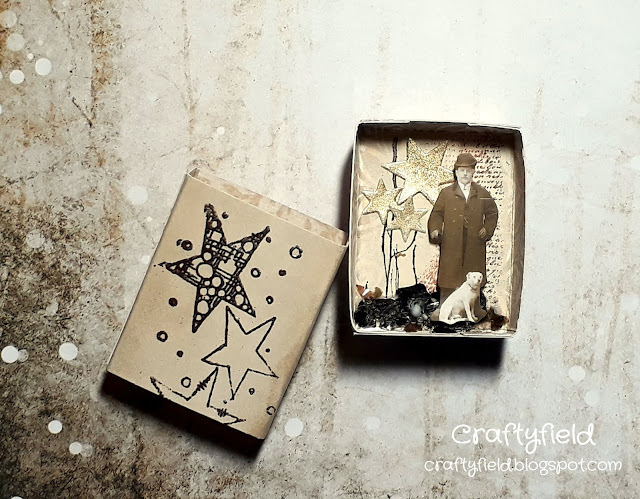 And I hope you didn't miss Leandra herself putting in an appearance with one of my favourite creations of all those I saw this year here on the PaperArtsy blog (and I'm not just trying to curry favour... honest!). It's an atmospheric piece of abstract art, with scrumptious texture, vintage script, some of my favourite colours and that glorious gleaming gold at the horizon line. Stunning! 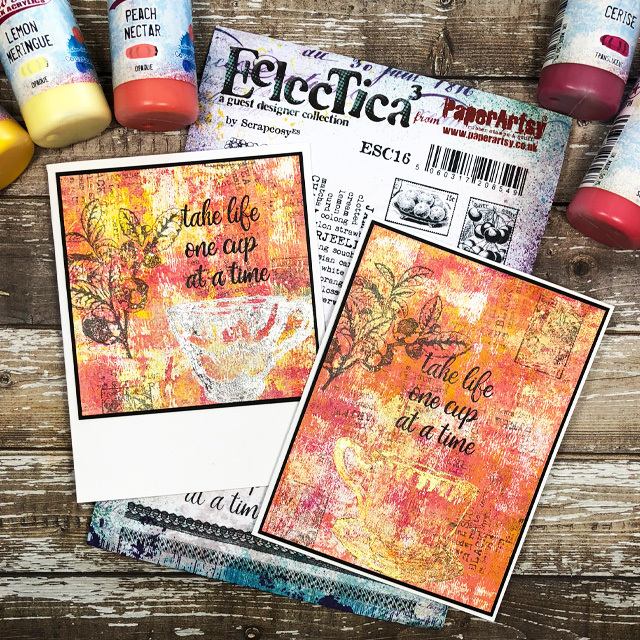 It's a second appearance for the delightful Scrapcosy teacup stamps in these fabulously zingy cards by Josefine Fourage. It's one of my favourite properties of a metallic shine that it has a now-you-see-it, now-you-don't quality. The foiled teacups appear and disappear amidst the vivid colours and brayered textures according to the angle of the light - magical! Quite a few of you took the opportunity to get cracking with your Christmas cards, but the challenge entry I've chosen to feature here has a more autumnal starting point. Mac Mable of The Sweetest of Peas used a real leaf from her garden and some humble kitchen foil to make this superb card. Check out that puddle of molten metal - I love it! 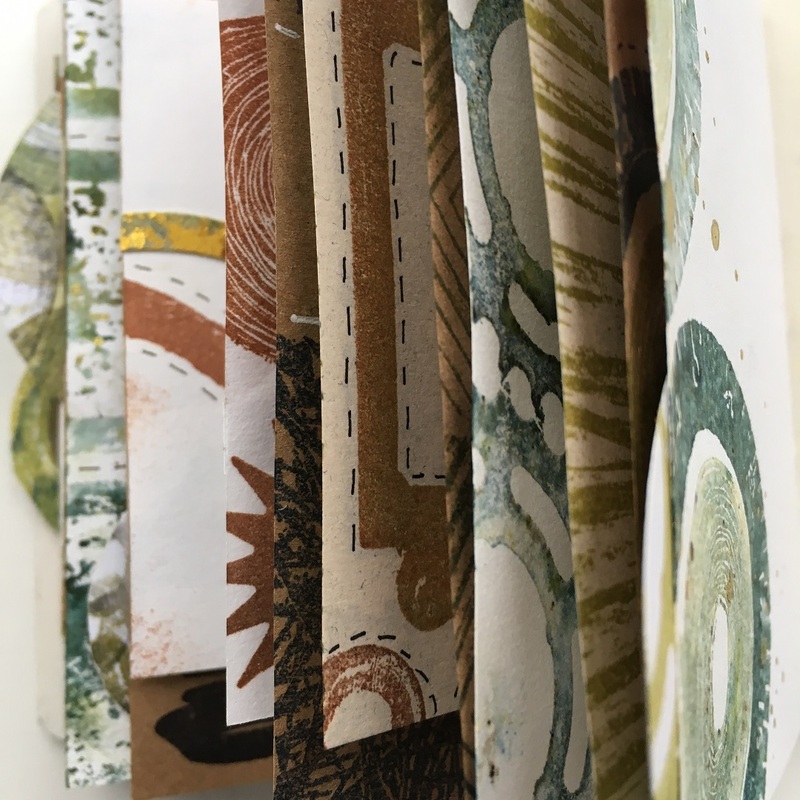 So many possibilities in this topic - hidden drawers, architecture and construction, surprises and nooks and crannies... and, as you might expect, there was oodles of imagination and inspiration on show in the projects shared both by the PaperArtsy designers and those who entered the challenge. You can tell it's a meeting of quirky creative minds when you see Helen Chilton in action with the brilliant Zinski stamps. This underwater fantasy takes you completely by surprise as BOTH ends of the matchbox open up to reveal more of the scene. It fills me with glee! I fell head-over-heels in love with this matchbox house by Corrie Herriman, using some of Courtney Franich's new stamps. Not only did I love the outside-the-box thinking of adding the triangular roof to the matchbox, but you'll have to visit the post to see her inside-the-box thinking. 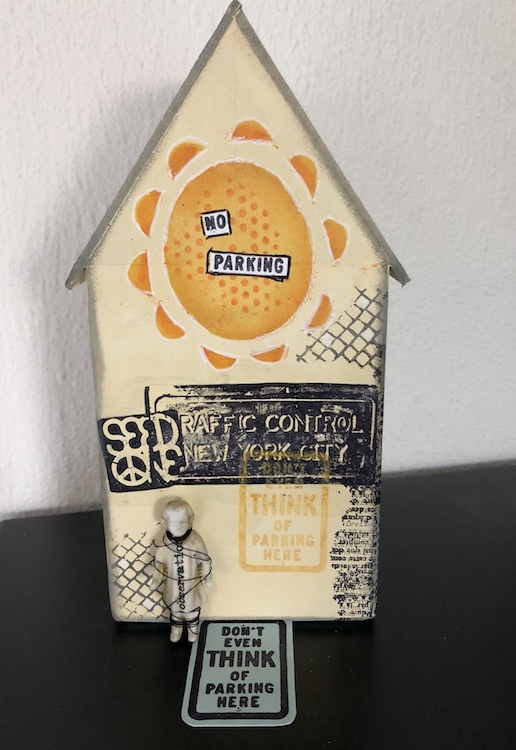 There's a reason you absolutely can't park on the no-parking sign at the bottom... it's a tab which pulls open a drawer containing an enchanting little mini art journal. A lovely surprise extra element. 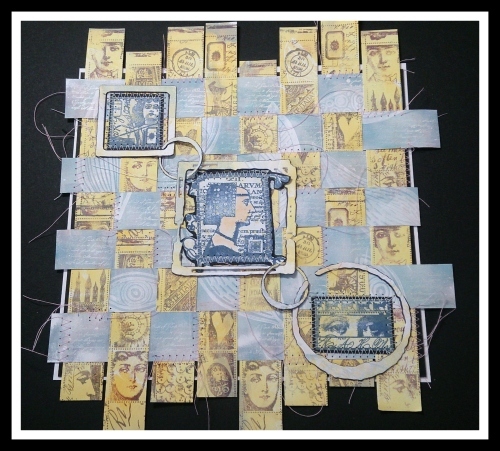 Etsuko Noguchi created an Egyptian treasure trove using this year's new Lynne Perrella stamps. Her jewel colours are glorious against the textured stone background, and those "exploded" matchboxes frame the exquisitely detailed imagery brilliantly. Not only that, but they've been done on shrink plastic to fit them into the boxes! Again, I highly recommend a visit to the post if you missed it - there are great close-ups to get the benefit of all the angles of this incredible project. Oh, and she used my Alison Bomber quote stamps too!! I'm sorry - I tried really hard to stick to just three designer pieces, but I simply couldn't leave out this incredible labour of love by Chris Dark. Think of it as your Christmas Bonus! 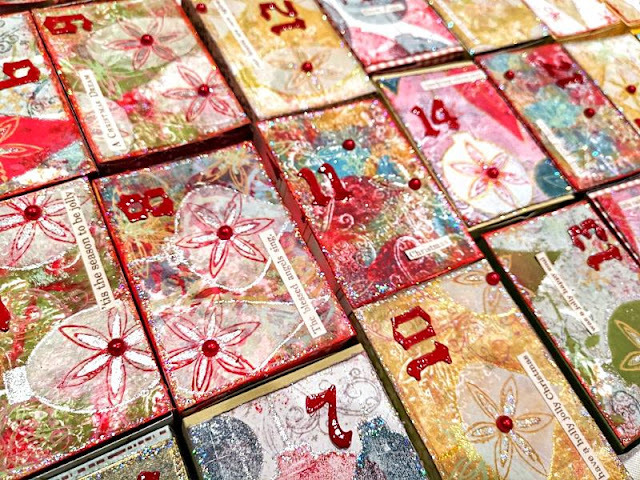 Her Advent calendar gift boxes are simply glorious... colourful, decorative, an absolute delight. By now it was the beginning of December and, of course, everyone gets busy. There were only a few entries for this theme, but I wish I could feature every single one of them - they were all amazing. Check them out at the end of the Intro post here. The one I simply couldn't resist, though, was this utterly captivating little vignette box by Christine of Crafty Endeavours. Do visit her post to see how those stars on the outside gleam in metallic copper in the right light. 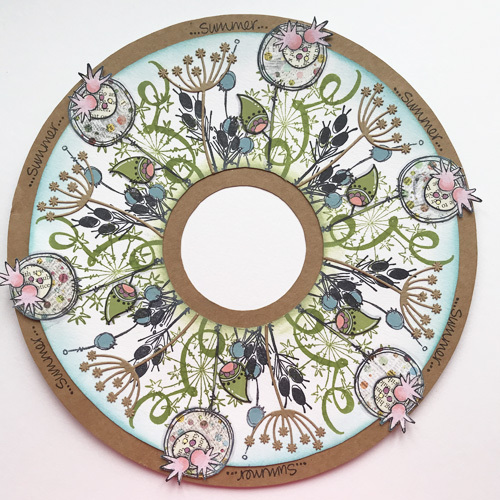 What a privilege to be part of the incredible team of creative artists and crafters here at PaperArtsy, and what a joy to see how the work shared here on the PaperArtsy blog fires the imaginations of so many more amazing creators out in the wider world. It may be a little time-consuming to create these end-of-year posts, but it's time so well spent, revisiting these inspirational projects full of ideas, techniques and expertise. I hope you've enjoyed reading these review posts as much as I've enjoyed putting them together. 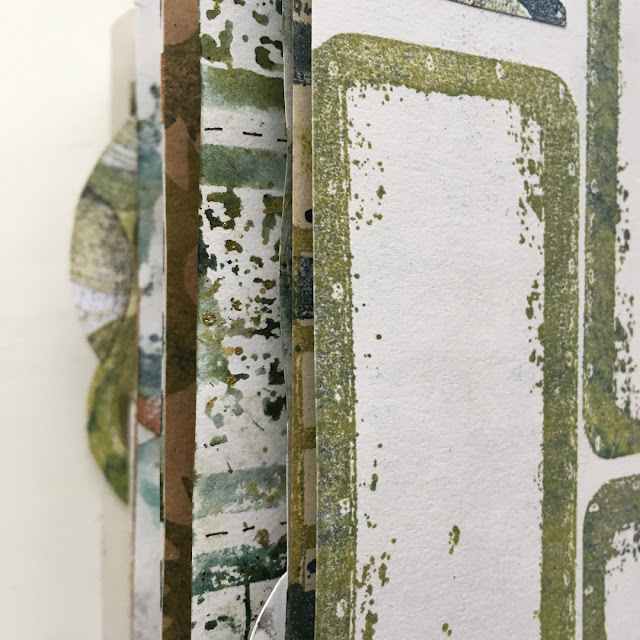 Tonight I'm sharing my picks from Topics 13-16: Mint, Sage, Claret and Gold; Baked Texture; ATCs and Re-inkers. Colour combos are always inspirational for me, especially when they are combinations that I would not normally think about. This combination was certainly one of those for me. But wow. The projects from the bloggers were amazing and it was hard to choose my favourites. My first pick is this amazing beauty by Anneke de Clerk. A very bright and colourful booklet using ETS stamps. 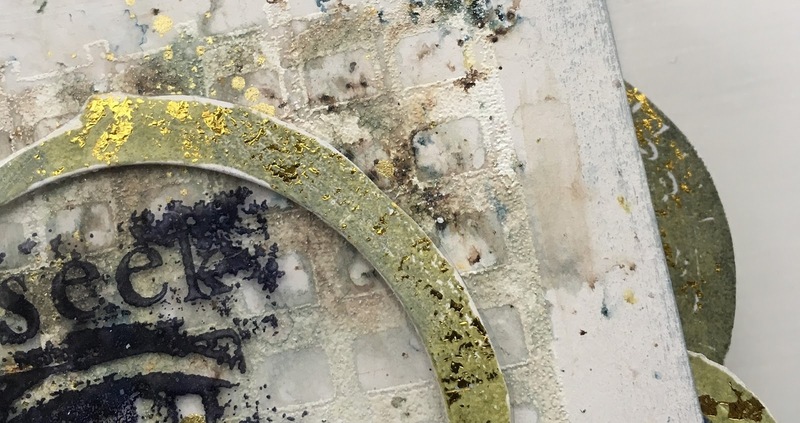 And I hope you didn't miss Ellie Knol's gorgeous home decor project. I just loved how Ellie used white stencilling in the background. Additionally we saw all sort of beautiful ways of using this colour scheme. I am sure you will agree that they all make the same colours look totally different. It really was inspirational. 2018 had everyone in a spin when Seth Apter announced the release of his Baked Textures. I remembered thinking that they couldn't possibly be much different to other embossing powders on the market. Then I tried them. And I was hooked. The introduction to this topic showed some amazing videos. Likewise, Raquel (Scrapcosy) produced two really helpful and informative videos on her experiments with Baked Texture. My first pick is this amazing beauty by Autumn Clark, using the wonderful Ink and Dog stamps. . A very textured project that I really wanted to reach into the PC and touch. Autumn really captured the beauty of the Baked Textures in this project. And I hope you didn't miss Nikki Acton's wonderful geometric canvas which showed how wonderful and versatile Baked Textures are. Additionally we saw all sort of techniques using the Baked Textures. There were so many beautiful ways to create texture and they were so easy to use. After the topic ended I still couldn't decide which Texture was my favourite - and I still can't. I really hope that we ill see more of these released. Artist Trading Coins burst onto the scene from nowhere - one minute I had never heard of them and next minute they were everywhere I looked. 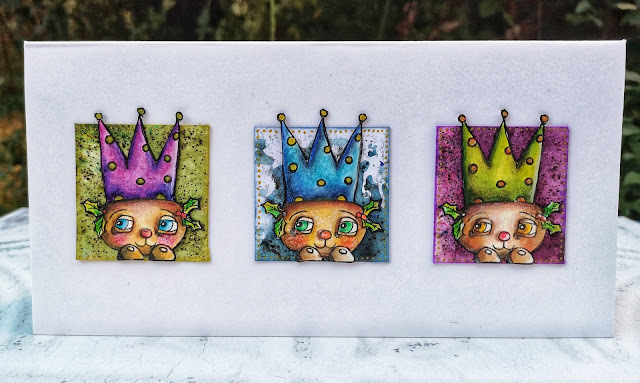 They are a great alternative to the classic Artist Trading Cards and are so fun to create. I enjoyed seeing so many ways of using these coins over the duration of the topic. I loved the Tea Bag art created by Alison Hall. This was an amazing way to create ATC's. I love drinking tea and was so inspired by Alison's coins. 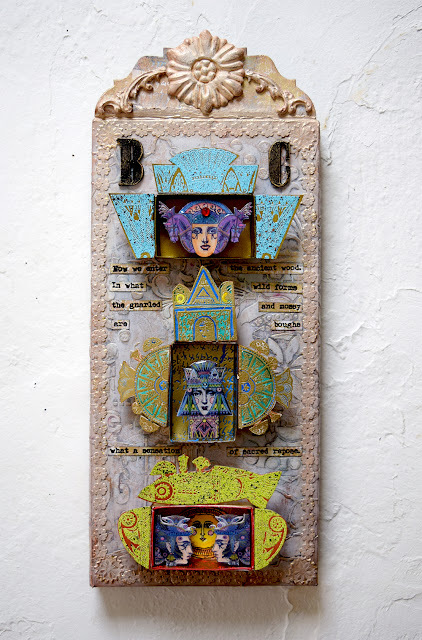 And I hope you didn't miss Chris Cresswell's bright and colourful ATCs. 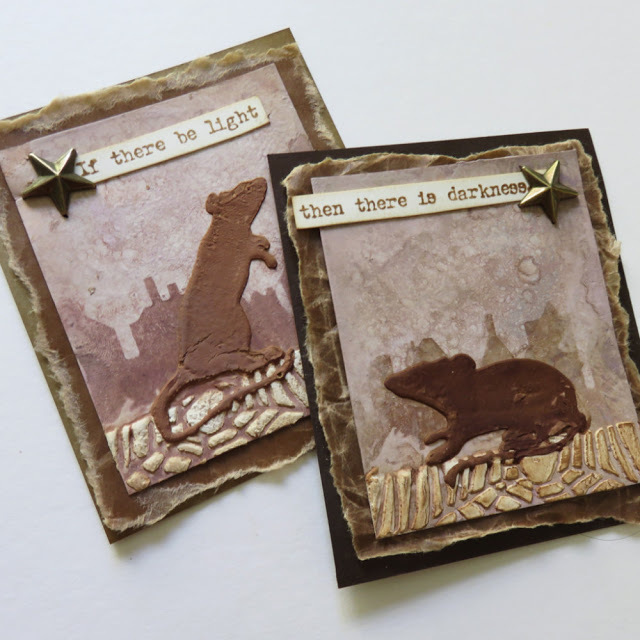 Chris started her ATCs by using a masterboard, which was a great way to make mini and individual works of art. 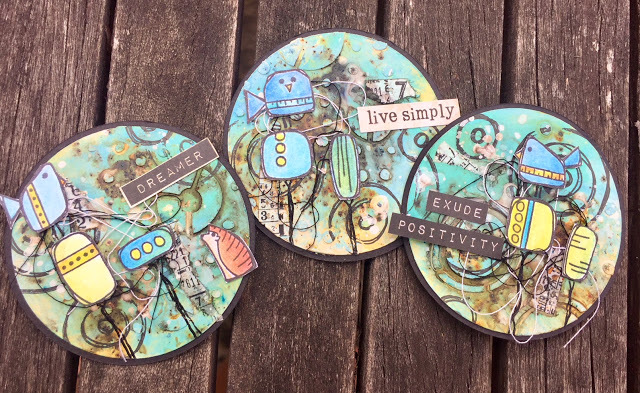 I adored how Claire Snowdon created beautiful works of art using Kim Dellow stamps - perfect for ATCs. I loved the colour scheme that Claire used for her Coins. The inspiration over this topic was truly amazing. 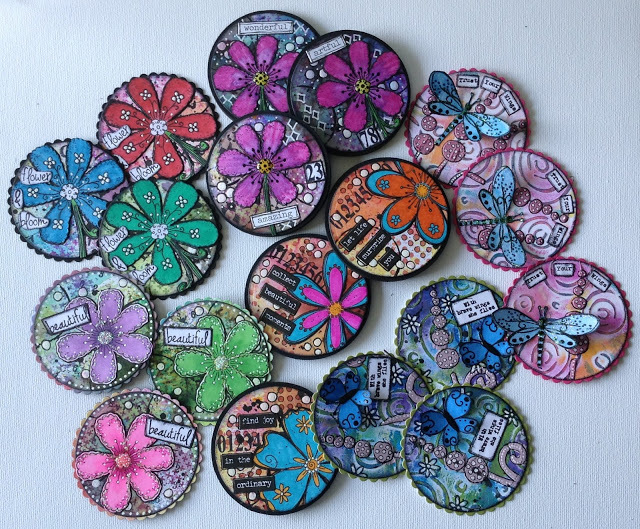 And I must admit that I am now a little addicted to creating Artist Trading Coins. I knew this topic was going to be a pleaser. Who would have thought that you could do so much with the humble re-inker that's main purpose is to re-ink an ink pad! My first pick is from Scrapcosy. You can see the original post here. Raquel shares an informative video of how she created her project . I certainly picked up a few great tips from this. And I hope you didn't miss Keren Baker's wonderful tag. This really got me in a festive mood. I adored how Lucy Edmondson demonstrated how to use re-inkers to create a custom ink pad. I did make sure I tried this technique and loved it! Additionally we saw all sort of wonderful ways to use re-inkers. Truly inspirational. It was really difficult to choose projects to review with you.